Well, I finally got around to making parsnip wine. Or should I say parsnip and sultanas wine as the raisins make the wine taste a lot better, or so I am told! Anyway, I started with 2kg (4lb) of parsnips, 1.25kg (2.5lb) sugar, 0.5kg (1lb) sultanas, 7g (0.25oz) of citric acid (lemon juice) and 1 UK gal (4.5 litres) of water. 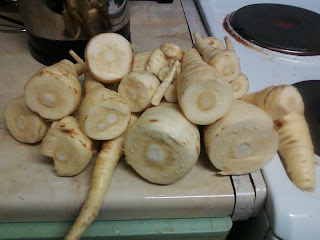 First step was to dig up the parsnips! And then scrub and scrub them again. But not peel! 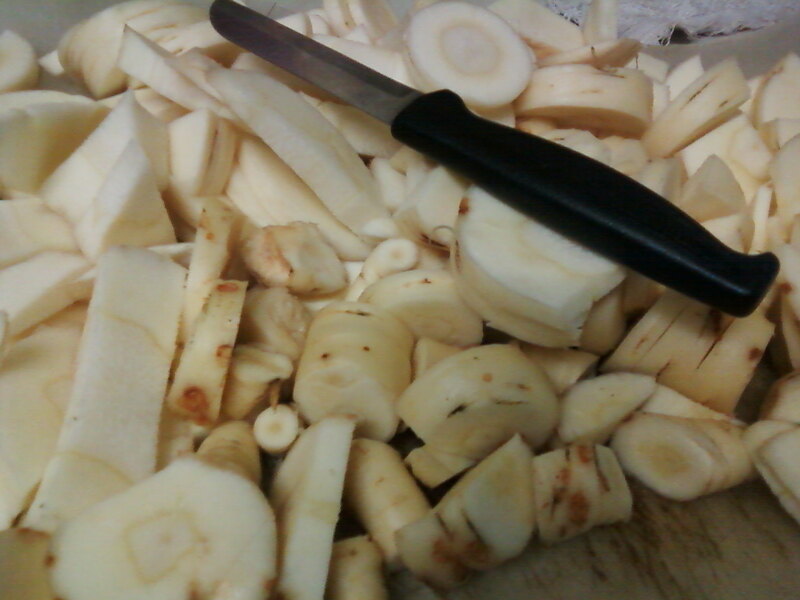 That's what 2kg of parsnips looks like! 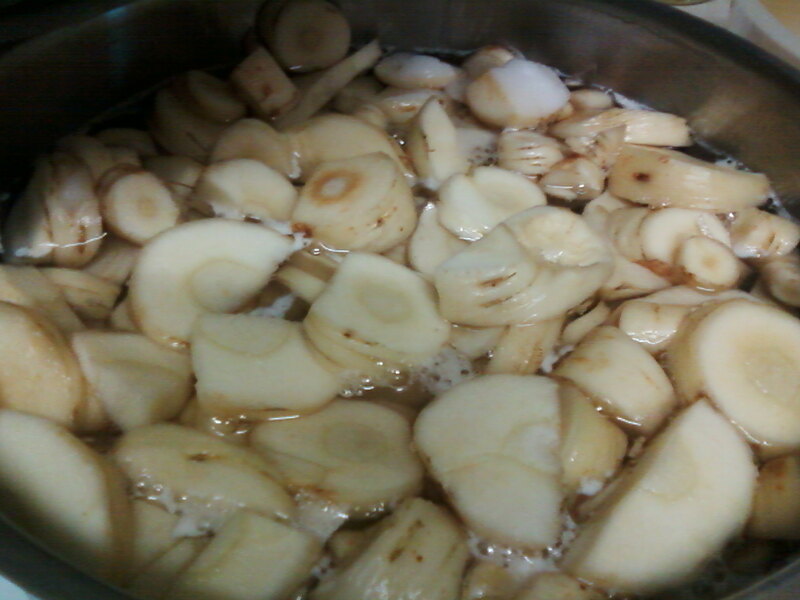 And then boil them for approx 15 minutes with the sugar, you want them softer but not in any way mushy. I had to do them in two batches as I didn't have a pan big enough. A day later I added the yeast and yeast nutrient and it only too about another 24 hours for there to be visible signs of fermentation. I now took a reading on the hygrometer, and it was right in the middle of the blue bit that said "start wine". Which was a relief! Though I am still a little confused as this seems to be between 1.070 and 1.090. whereas you are supposed to start between 1.095 and 1.110. However a quick search on Google and a bit of head scratching showed that there's correction factors for temperature, volume of wine etc so it seemed to be ok And it was in the right range on the actual hygrometer! 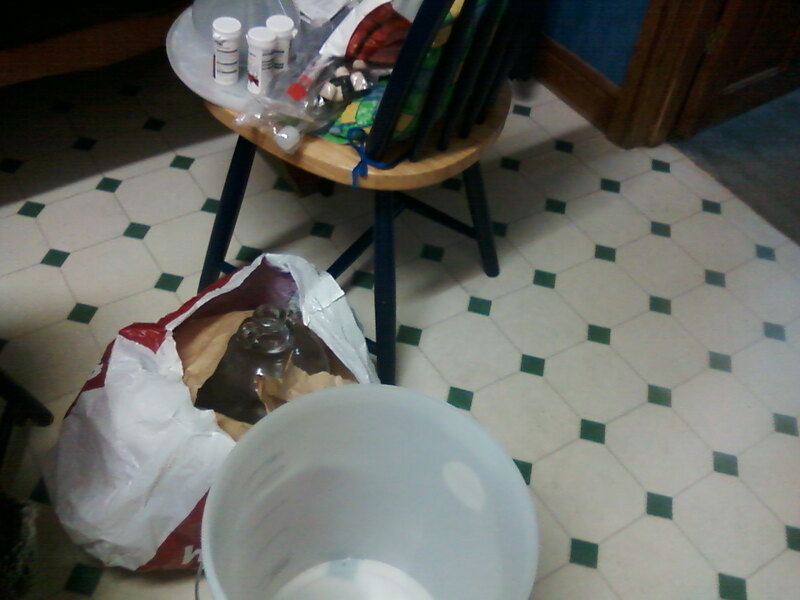 The plastic pail lived in a corner of the bedroom for 3 days, in hindsight it should have been slightly warmer as the fermentation did slow down a bit. However, now came the awkward bit. With the help of one of my daughters (money changed hands!) 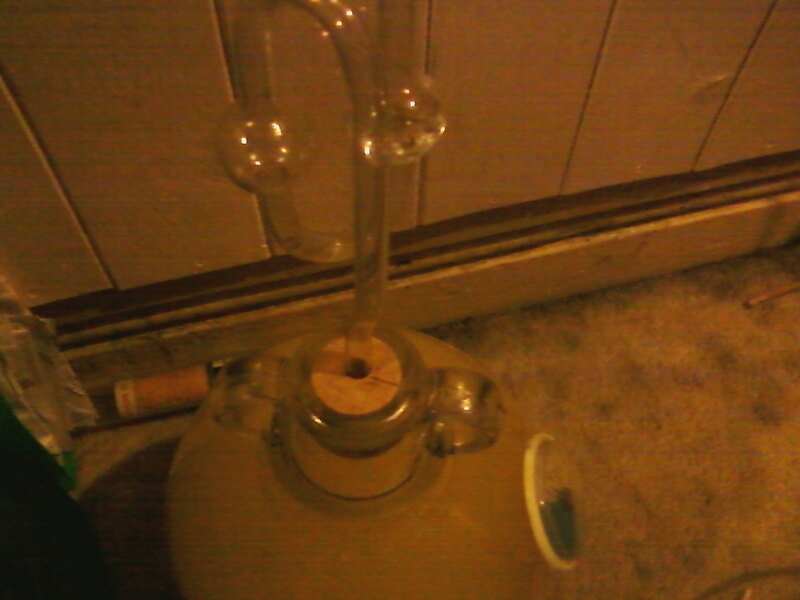 we filtered the mixture into a demijohn using a plastic funnel with a sieve placed inside the funnel. Not an easy thing to do, as the plastic pail is quite heavy and there is a danger of a stray piece of parsnip or sultana falling into the demijohn off the side of the funnel! If that happens, pour the mixture back into the pail and start again. You will need to scrape the sieve out quite frequently as the holes get clogged up. So the wine is now sitting in the demijohn, plopping away every so often as the bubbles come up and there's a small thermometer on the side reading 20.5 deg C which is a bit warmer than in the pail as the demijohn is smaller and can be put a little closer to the radiator. Don't go over 30 deg C or you'll kill the yeast and below about 10 deg C the fermentation would slow down or even stop - there was a noticeable difference between 20 and 15 degrees C in the pail. So, in 3 months time I should have some wine ready for bottling but it depends on the dryness, I may need to add more sugar and ferment a bit longer as I am not keen on dry wines.